I am showing these two screen shots to help show what schools to fish and what not to fish. In the shot above the fish are not active. Notice how they are staging near the bottom and tightly together. Side scan is not showing much activity either. A boring screen is not a productive screen. Now this shot is a happy screen. On the sonar part of the screen you see fish "streaking" throughout the screen. I also have my screen on zoon and am looking in the light blue area of the water column as you can see on the right of the screen. I do this because that is where the fish are, why look in the upper water column where there are no fish? This also shows the fish with much more detail. This being a touch screen all you do to adjust the zoom area is touch the blue and slide it up or down, pretty simple. 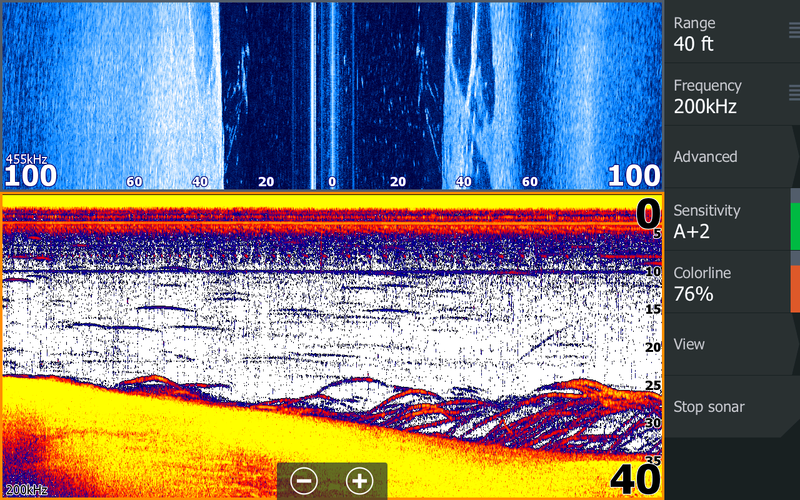 The side scan screen is just as active as the sonar screen. 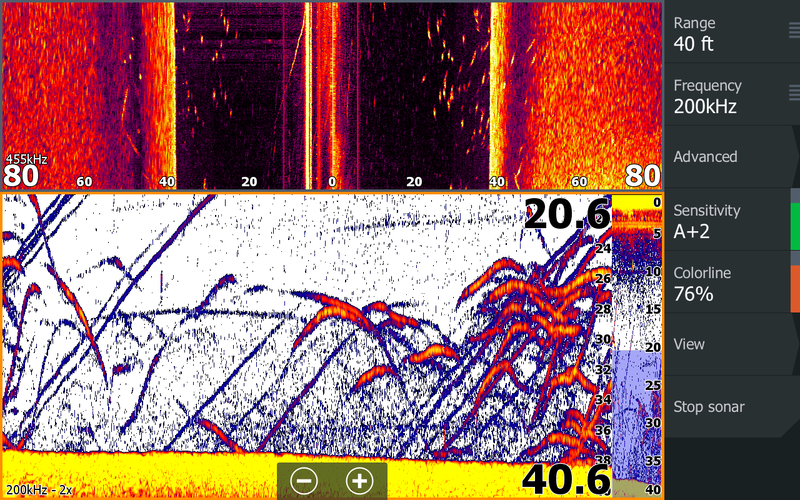 Notice all the Stripers [ light vertical dashes] that are on both sides of the boat. When you see this and you have baits in the fishes face you should be hooked up. These screenshots were taken off of a HDS12 Gen 2 that one of our guides Anthony is going to sell. If anyone is interested in purchasing the unit contact me at Jim_Hemby.com and I can show you the unit, even on the water at my convenience. We are Navico Pro Staff and are ready to upgrade to the Gen 3 products.